HomeTo Wipe Or Not To Wipe? To wipe or not to wipe, that is the question. Now, don’t panic, I am talking about sweat! In Bikram yoga class! Sheesh. I am a closet wiper, but only on my face at a few key moments in class, otherwise I leave the sweat alone, letting it do its job to cool my body naturally, which is the recommended method. I would prefer to leave the sweat alone on my face as well, but sometimes self-care takes precedence. It’s hard to argue with the science of it. Sweat is the body’s primary method of cooling off in warm environments, but in order for the cooling effect to work, the water must evaporate. If it drips off or if you wipe it off, you will not benefit from the cooling action of the evaporation. I also enjoy the feel of the sweat on my body during class. It helps lubricate things when trying to wrap my leg in Eagle pose and gives me a visible sign of my hard work as the sweat drips from my fingertips between standing series postures. I even like the occasional drip of sweat on my lips, which lets me sneak a tiny sip of water (read “sweat”) before party time. The level of saltiness gives me a sense of how healthily I have eaten or not in the past few days. Despite all that, I do dry my eyes and ears a couple of times during class. Teachers ask us to push ourselves, but only to the point that it is productive. If you can, you must, but if you have lost control of your breath, it is time to back out of a posture a little bit. Or if you are dizzy, it probably makes sense to sit out a posture or two. Self-care during class is important and that is why I wipe the sweat. Let me explain. I wear contact lens and not only does the sweat sting my eyes, it can sometimes dislodge a lens. I would rather keep the sweat out of my eyes than be distracted by a roving contact lens during class. And I wear hearing aids deep inside my ears. I need to keep these as dry as possible so they don’t short out. That would make it hard for me to hear the dialogue during class, let alone all the other important sounds I need to hear throughout the day once class is over. I just can’t risk it. Yoga isn’t perfect, and neither is my practice, but maybe that is what keeps me coming back. In so many ways, yoga is like life, and I believe in both, it is only through self-care that we can stay safe and grounded, while we continue to push ourselves forward, to enjoy, and to grow. 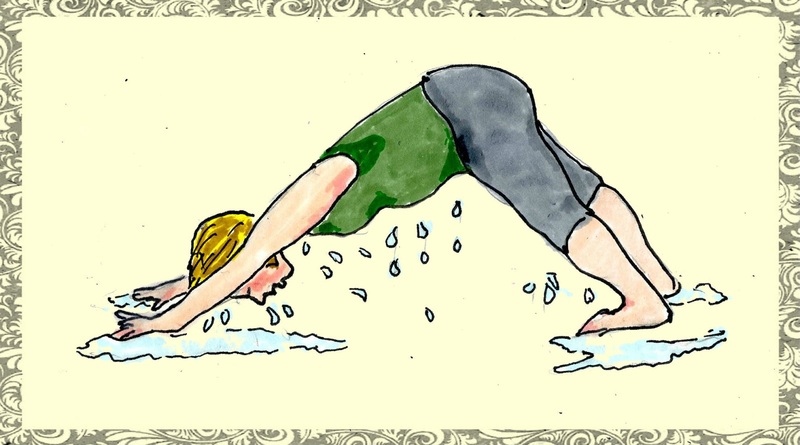 Readers, do you wipe your sweat in Bikram yoga class? This post first appeared on Bikram Yoga NYC. ← Keep Those Shoulders Down! NO WIPING! I learned that at BYNYC – and it really is important. But like you, I wear contacts, and do need to wipe around my eyes, and your ears make sense too. When I say “no wiping”, I mean the wholesale swabbing down your body I see some do. It really does make you hotter to wipe! I think wiping sweat is part of the learning experience. Brand new students frequently wipe sweat because its their natural impulse to this extremely intense new experience. They have to be taught and reminded to leave it alone, let if flow, it will only come back, you’re wasting your energy and actually preventing your body from cooling itself. Love your sweat, embrace your sweat, crave your sweat even! I sweat rivers and lakes and streams every class and can’t wait to do it again!! Live to sweat. Sweat to live! That is a great insight! Thanks for sharing! I just started Bikram so it’s helpful for me to read this stuff. I haven’t been wiping down but sometimes wipe the side of my face like if I feel sweat dripping into my ears and eyes. That feeling is very distracting and uncomfortable so I just get rid of it on occasion. Makes sense. Good luck with your practice! Thanks for reading.